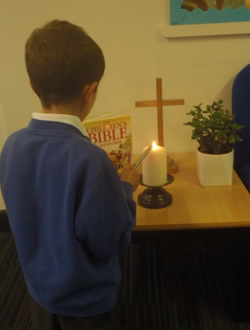 Our Ethos is based around our School Christian vision. As a voluntary aided Church of England School the principles of the Christian way of life are implicit in all we do. Our Christian vision and values underpin our ethos, everyone is valued and encouraged to achieve their full potential. Every member of our school community is encouraged to respect and value each other. "Deeply held Christian Values are at the core of the school; underpinning its life and defining its purpose." "The headteacher and key staff are a successful team whose Christian leadership is inspirational." The full report can be found on our Inspection Reports page. We are a faith based but not faith biased learning community, where all children are valued regardless of their faith. 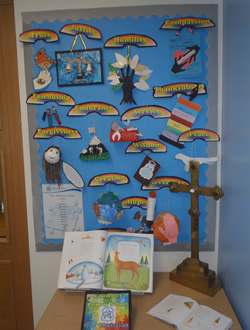 Ashford Church of England Primary School aspires to be sensitive to the needs of every child, reducing barriers to learning and making the curriculum accessible to every pupil. Our aim is to enrich the lives of all our pupils by pursing an inclusive policy towards our pupils which celebrates diversity, understands the importance of common identity and reflects our Christian values. We will strive to champion equality for people with disabilities and aim to make reasonable adjustments to physical and other arrangements of the school where considered necessary, taking into account the nature of any impairment, pupil and parent views and advice from teachers and other professionals. Prospective parents are asked to inform the school of any disabilities or additional needs their children may have when registering. We feel ongoing communication between parents and staff is vital to ensure that reasonable adjustments can be considered where necessary, whether impairments are apparent when the pupil enters the school or developed at a later stage.